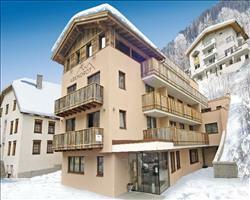 Chalet Zita is a charming and traditional chalet offering excellent value for money. The chalet’s elevated location, overlooking the fabulous centre of Ischgl, is a special feature and you can ski back virtually to the door! Starting your ski day from the Zita couldn’t be easier using the unique ‘travelator’ (a moving walkway) to take you in style to the main Fimbabahn gondola just 3 minutes away. The Zita’s dining-room and lounge areas were both refurbished last season to bring our guests a cosy and welcoming atmosphere. Most of the comfortable bedrooms offer en suite facilities with shower or bath, wc and many also have a balcony. The village is just a short walk away (approx. 5 minutes) enabling you to enjoy the famous nightlife of Ischgl. Rooms 11 and 12 have £50 reduction per person per week. We update Chalet Zita's details often, but facilities do change. e.g. some extras listed by the supplier as "free" or included might only be for the first time you use them, or for one time per party, then charged for further use. If any specific feature is essential to your holiday, make sure you ask us to confirm the details of it before you book your holiday. Ischgl lift pass price last reported as 219.00€ 6 days. Ask for a quote when booking Chalet Zita. Chalet Hotel Aben... Ischgl Austria, Dover Ferry 7th December.